Once started and running, a centrifugal pump can operate with a vacuum, with its negative suction pressure, on the suction side of the pump, but prior to starting there could be air present in the pump casing to prevent proper operation. But even a pump with a proper suction supply can have air in it, or not be fully primed. We are often asked about how to prime pumps when first installed, or how to prime pumps that are used with a water level source below the elevation level of the pump (not flooded suction). Unless you have a self-priming centrifugal pump (liquid primed, compressed air primed, or vacuum primed), you will need to manually prime it anytime it might become filled with air or gases. Priming a centrifugal pump is essential if you want it to function properly, otherwise the suction pressure created will not be sufficient enough to lift water, and this can cause issues such as overheating and pump failure. Unfortunately this isn’t too uncommon since the valves can leak, but the good news is that this process isn’t difficult to perform! When it comes to priming a centrifugal pump, there are several angles of attack. The goal of each of these methods is to fill the centrifugal pump casing with liquid before the pump is started (and therefore remove any excess air or gases which can displace water). Use of a suction supply below the pump requires installation of a foot valve in the suction piping, so that liquid doesn’t drain from the pump casing or suction piping when the pump stops. This requires filling the pump with liquid from a priming pump, a pressurized discharge line, or another outside supply. Use a suction supply above the pump. You’ll want to slowly open the suction isolation valve and then open the air vents on the suction and discharge piping until the pumped fluid flows out. Once this happens you can close the air vents and discharge the isolation valve. Double check this valve and then suction the isolation valve if required. Filling the pump with liquid prior to startup. Many pumps have air vents just for this purpose. 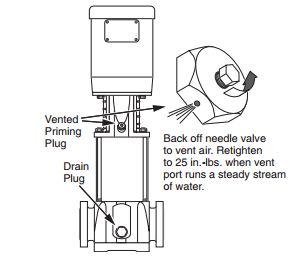 With positive pressure on the pump suction, and with the discharge isolation valve closed, loosen the air vent on the top of a pump casing and allow water to escape briefly. Close the vent at this point. Follow these typical priming steps to get started, or refer to the user manual that came with your pump for specific directions. These general steps can help get you started on pump priming, but if you have any specific questions don’t hesitate to contact our experts here at Steven Brown and Associates. We’re always happy to help!